Jane Jacobs pointed out that there were enterprises or uses which she referred to as `exploding’ the street that were not, in themselves wrong, but which were harmful if they were operating at too large a scale, with too much disproportionately large street frontage. 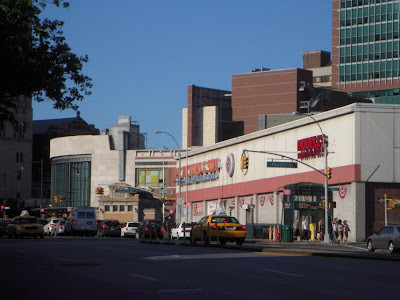 The disproportionately large street frontages at Ratner’s Atlantic Centers are examples of such street exploders and bode ill for Atlantic Yards. Security problems at Metrotech have created similar problems at that location which have gone unaddressed. 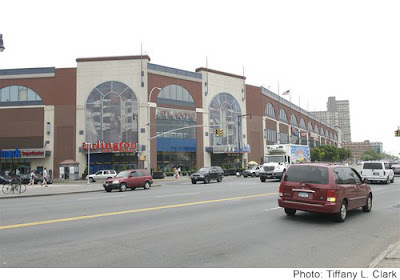 But even if the ground floor space at Atlantic Yards is leased to retail operators that use smaller street frontages in a break from past Ratner practices, the effect of the street being broken up will occur because the buildings in Atlantic Yards are spaced apart so that they will not have continuous uninterrupted streets. They will be unavoidably broken up by large gaps. If anything, this may make it more of practical challenge to arrive at good street frontages where there is continuous street frontage.